A 7am start after a lovely breakfast a scenic winding climb up to Makuti although PJ’s MG once again has a loose bolt and the unnerving rattle in the right front tamed the pace. A small section of the road was very warped and at speed would be hard to navigate safely. The Makuti Hotel at the top, still stands and staff were eager to serve tea while PJ tightened a bolt and Mike replaced a filthy fuel filter. TIP OF THE DAY The stretch from Makuti to Harare is busy with heavy laded trucks and many abnormal loads. They bunch together and poor road markings make over-taking dangerous. We agreed to take it easy and meet up at every town as opposed to keeping in a convoy. Alas, Mike’s MG started jerking and making progress at a stop/start pace was dangerous with the trucks barrelling down and past, coming to a halt on a rise with almost no verge. PJ (again on Recovery duty) towed the car up to a safe area where it could be loaded on a trailer. Murphy’s ensured that the next safe area to pull off was the same spot the Police had set up a road block. They watched us load the car 100m away, and as we pull off, stopped us and chastised PJ for illegal towing. Some energetic debate about necessary safety measures ensued and we were on our way without a fine! TIP OF THE DAY – stick to 100kms if you are towing! 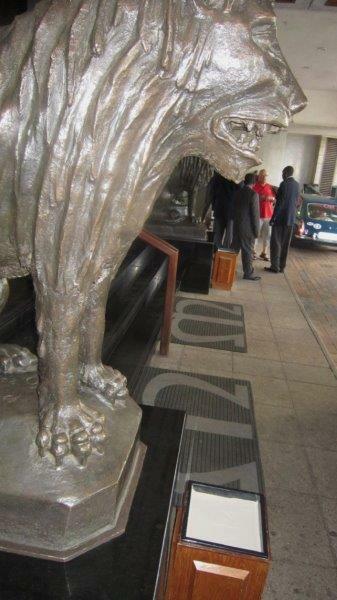 Unexpectedly, all the traffic lights in Harare were working and we easily guided the small entourage to the Meikles Hotel in the centre of the city. Followed by a great welcome and efficient check-in (particular thanks to Ardmore), the Group split into ladies tending to hair-do’s, guys visiting Buster Bichard’s collection of about 80 cars where Mike was offered facilities to repair his car. Suzette and PJ chased about visiting dear friends and God Children. Dinner at Alo Alo Restaurant for 100 people … a social highlight thanks to Lesley, Adrian and staff and the joining-in of the local car enthusiasts – it was a pleasure to spend time with you all and we look forward to returning the compliment when you come to Gauteng! The Group RAVED about the deep fried Halloumi starter and both the chicken and pepper steak main course had us waking up wishing for more. 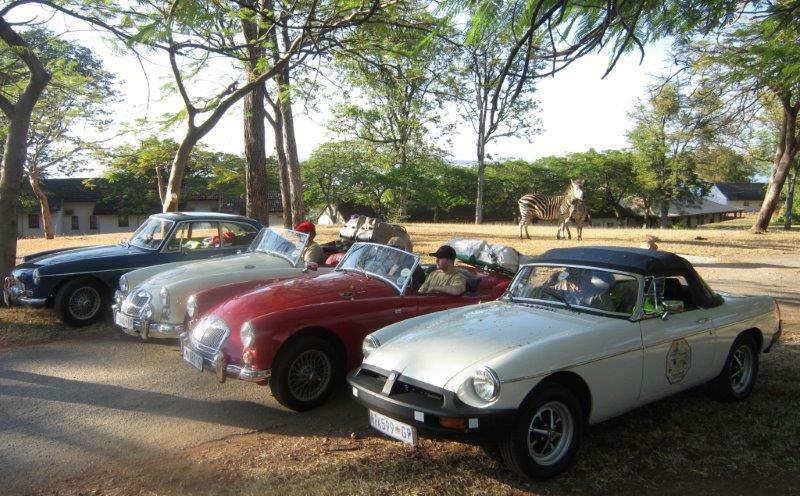 Hentie Erasmus was the only car “Still Standing” at Dinner – most were left resting back in the Meikles car park so thanks also to great bud, Iain Henson, for escorting the Group home after dinner – yet more old fashioned Zimbabwe hospitality. TIP OF THE DAY There are many desirable car collections to be viewed in Harare.